Like most people, when something happens that feels like it’s beyond your control, men who experience hair loss often look for answers or, more likely, someone to blame. However, many of the myths about the male pattern baldness gene are false or at least misleading. If you have started noticing the symptoms and signs of male pattern baldness, don’t just sit back and take it. Learn how to stop hair loss and keep that full head of hair that you love at our New Bedford hair loss clinic. Our team of highly trained and experienced technicians will provide you with a treatment program that is designed specifically for your type of hair loss. We base our approach on the underlying cause of hair loss, the rate of hair loss, your hair’s natural growth pattern, texture, and everything else that is related to you and your hair. Unlike other clinics, we know that there is no such thing as a one-size-fits-all solution when it comes to learning how to stop hair loss. That’s why we tailor each treatment program based on the unique needs and lifestyle requirements of each client. Studies show that nearly two out of every three men in America will begin losing their hair to some degree by the time they are 60 years of age. 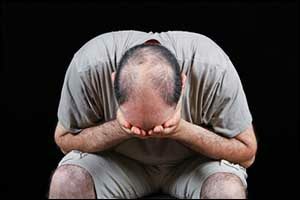 The most common type of hair loss is male pattern baldness. There are many things that can trigger the male pattern baldness gene and result in the typical receding hairline. Much has changed in the understanding and approach to combat the signs of male pattern baldness over the years. In addition to genetic causes, the age, health, and habits of the individual can contribute to the rate of hair loss. However, when it comes right down to it, genetics will often play the most significant role. One of the latest ideas going around is that hair loss comes from the mother’s side of the family. This is not entirely true. The male pattern baldness gene is on the X chromosome, which does come from the mother, but studies have shown that men are more likely to experience hair loss if their father also suffered from male pattern baldness as well. Hair loss also is not restricted to “old men,” as there are many 20-30 year-olds who also experience hair loss that come to our New Bedford hair loss clinic. While wearing a hat won’t increase hair loss, wearing a dirty hat could cause a scalp infection that might lead to other types of hair loss. Trauma, prescription medications, and other medical treatments can also lead to signs of male pattern baldness without actually being due to the male pattern baldness gene. The best way to learn how to stop hair loss and prevent the signs of male pattern baldness and other types of hair loss from increasing is to visit our New Bedford hair loss clinic. At South Coast Hair Options, we provide a wide range of treatment options designed to address your hair loss concerns. Laser hair therapy and our successful Corrective Hair Solutions (CHS) can be used to help you fight against the male pattern baldness gene and get that full head of hair that you dream of having once again. Our goal is to find the perfect hair loss solution that works with your lifestyle, budget, and schedule to ensure that you look great and feel fantastic. Our state-of-the-art solutions help provide options to enhance your natural appearance. Our approach is unique, and you can see it in the results. Corrective Hair Solutions do not represent a one-size-fits-all solution, but many different treatment options that can be used together or alone, depending on your individual needs. Our technicians start by performing a free scalp evaluation to identify the cause for signs of male pattern baldness. They take into consideration your unique pattern of hair loss, the rate of hair loss, and your hair’s natural growing patterns and tendencies. Our solutions are affordable, safe and natural, and are designed to not restrict your active lifestyle. They work with your existing hair and can be used to solve ALL types of hair loss problems. To learn more about South Coast Hair Options and how to stop hair loss, contact our New Bedford hair loss clinic by calling 508-995-7085. We can answer any questions you might have about our approach to the male pattern baldness gene or schedule an appointment for a FREE consultation and scalp evaluation.